Colorado DAR | The Colorado State Society NSDAR is a vibrant, growing organization of women who are interested in America’s rich history, promoting education, researching their family heritage, encouraging patriotism, and serving their communities. The Colorado State Society NSDAR is a vibrant, growing organization of women who are interested in America’s rich history, promoting education, researching their family heritage, encouraging patriotism, and serving their communities. Mary Green Montgomery Slocum founded the Colorado State Society of the DAR on May 13, 1895. With 42 chapters statewide and over 3,000 members in Colorado, DAR members are dedicated to promoting education, historic preservation, and patriotism. The Colorado State Society NSDAR is a vibrant, growing organization of women who are interested in America’s rich history, promoting education, researching their family heritage, encouraging patriotism, and serving their communities. The National Society Daughters of the American Revolution was founded in 1890 and incorporated by an Act of Congress in 1896. One of the largest women's service organizations in the world, the DAR is comprised of volunteers who lineally descend from someone who served or assisted our new country in the American Revolution. Mary Green Montgomery Slocum founded the Colorado State Society of the DAR on May 13, 1895. With 46 chapters statewide and over 3,600 members in Colorado, DAR members are dedicated to promoting education, historic preservation, and patriotism. DAR members come from diverse backgrounds & hold a variety of interests. Our common bond is a lineal descent from Patriots of the American Revolution. Any woman over 18, regardless of race, religion or ethnic background, who can prove this lineage is eligible to join. Colorado has 46 chapters across our beautiful state; from the eastern plains and Arikaree River to the towering San Juan Mountains, Four Corners and the Western Slope, to Grand Mesa, around fossil-filled parks to the Poudre Valley and points in between. The NSDAR was founded in 1890, during a marked revival in patriotism and intense interest in the beginnings of the United States of America. The objectives laid forth in the first meeting of the DAR have remained the same in over 100 years of active service to the nation. 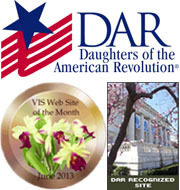 The DAR, founded in 1890 and headquartered in Washington, D.C., is a volunteer women's service organization dedicated to keeping America strong by promoting patriotism, preserving history and supporting education programs. DAR members volunteer more than 250,000 hours annually in support of veterans, active duty military and their families and communities, award thousands of dollars in scholarships and financial aid each year to students, and support schools for underserved children with annual donations exceeding one million dollars.